1) This is an unconventional take on an old familiar song. Over the holidays, do you prefer traditional carols? Or do you like to mix it up with with more contemporary fare? I typically prefer the traditional carols. 2) Now that Christmas is behind us, are you enjoying a relaxing week? Or do you have socializing/celebrating/chores to do? We still have another family event to go to. We will take out tree down next week, so I will begin the cleaning then. 3) Winter is a time for cocooning. What book or movie did you enjoy in 2018 that you would recommend to your fellow Saturday 9-ers? the book She Believes by Debbie Lindell for a book. I cannot remember too many movies from this past year. 4) Looking back on the past year, what was one of your happiest moments? doing things/making memories with my mom, husband and my son. We went to Phantom of the Opera and Nutcracker. 5) What was the smartest thing you did all this past year? seeing all of the doctors we went to see. I was pretty much given a clean bill of health. My son was given a diagnosis of anxiety and depression, but he is getting help for that now. 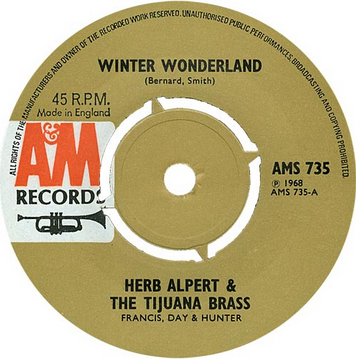 7) This week's featured artist is Herb Alpert. Because of the style he popularized and the name of his band, people assume he's Hispanic. Yet his parents were Jewish immigrants from Romania. What's something we'd be surprised to learn about you? I am super shy and I worry it makes me look rude or hard to get along with. 8) He performed an instrumental version of "The Star Spangled Banner" at Super Bowl XXII. How did your favorite sports teams do in 2018? The St. Louis Cardinals struggled and The Kansas City Chiefs are doing ok, they are in 1st place, but I am concerned about them. 9) Random question: When did you last check your social media feed? right before I got on here to answer these questions. I am new to Saturday 9, but I am enjoying it so much and I have loved meeting each and every one of you! Thank you for making my Saturday so much fun. Happy New Year! Fun blog post! Happy Holidays to you! Making memories is a great answer for that question, and I’m glad you’ve been given a green light for good health, and your son also is getting what he needs. Hope you have a great New Year’s Day and a calming and sweet year. I’m looking up the authors that you and Harriet mentioned. Loved your answers to the Saturday 9 meme Lori. I didn't do this one as I've not been actively blogging until after the holidays. Have a happy and blessed New Year holiday my friend. You're a welcome addition to the Saturday 9! I'm glad you had some good family times this year and that you got a diagnosis for your son. Just having an answer can mean a lot. #8 -- It occurs to me that we can't both be happy during the summer. :) I keep hearing eastcoast based sportscasters say that the Red Sox/Yankees rivalry is the fiercest in all of sports. I just snort. We know better, don't we? And I'm so happy you have joined us for Saturday 9! Yes, family and God, where was my brain was and I didn't include God in my answer. SHAME ON ME!!!! So glad you have joined in on the Saturday 9, it's always fun. Blessings abundant in 2019! Welcome to Saturday 9 -- loved your answers. Fun questions and I enjoyed reading your answers today! Welcome to Saturday 9! It cracks me up how fast everyone I know takes down their trees etc and how early they had them up. I have one friend who has hers up in October. Happy to have you on Saturday 9. I haven't taken my decorations down yet; I am still waiting to have Christmas with some sick family members.